A basic setup for multi-record tables is to have three forms. The setup instructions will take you through creating three (3) forms and the connections between them automatically. It's the typical way most multi-record tables would be setup, but this way gets it done in a few steps vs many. 1. Settings > Table > Open the Table you want to base the form off. 3. Enter the Settings prompted. Forms Base Name - name your new form(s). Typically, this will be the table name for convenience. Mirror Overview and Details Forms - this option will copy fields added to the Edit form to the Details and Overview forms. This is great for a quick setup and simple forms. For more complex forms, you may want to unlink the forms later. Link to this form - adds a link to the entity's default Cover Page. If you leave this prompt empty, no side bar link will be created. 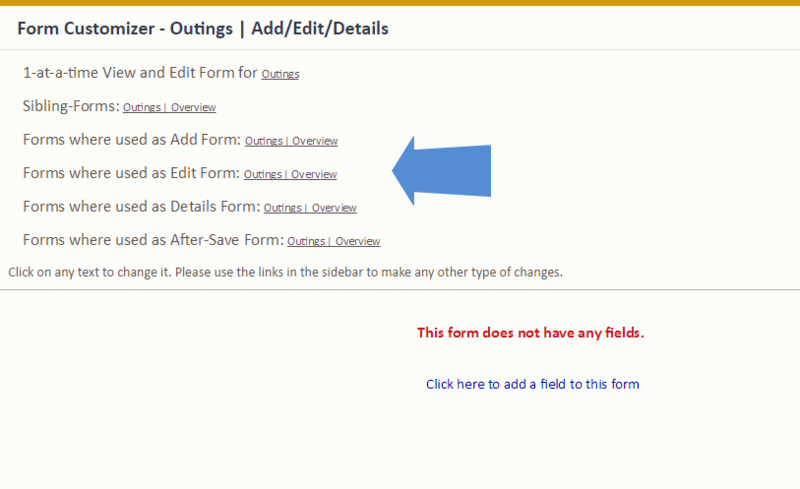 After Save, you are taken to the Add/Edit/Details form to add fields and modify the form. At the top of Form Customizer screens for linked forms, SAM will show links to the other forms also created during this setup. When you access the linked Overview form, an option to unlink the two forms is available. This would be done to breakup the information about a record, to show high-level information on Overview forms and more specific details on the Add, Edit and/or Detail forms.